Back in November, the Cubs claimed lefty Ian Clarkin off of waivers from the White Sox. Then, less than a week later, the White Sox claimed him right back. Now, the Cubs have done it again, claiming Clarkin again from the White Sox … which is great, because now this big long thing that Michael wrote about Clarkin that I had to totally X out is relevant again! Well, at least for a few more days until Clarkin is claimed by the White Sox again. 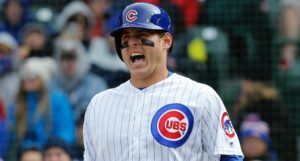 “Like we said at the time, it’s not quite clear if Clarkin, 23, will be a starter or reliever with the Cubs going forward – he’s done both in minors, in the past – and he’s not likely to make an immediate-impact, but he could figure into the Cubs plans as soon as next season. So let’s take this opportunity to get to know him and see what exactly the Cubs picked up. Clarkin was originally drafted by the Yankees as a high-profile high schooler back in 2013 (33rd overall, $1.65M bonus). He got a few innings that season, but like most June draft picks, his career didn’t really start until the following season. In 2014, Clarkin began his career in A-ball, earning a 3.21 ERA (3.74 FIP) over 15 starts (70.0 IP). According to Baseball America, that was enough to land him among the Yankees top-10 prospects (#6) and among the South Atlantic League’s top-20 prospects (#15). A three-pitch lefthander, Clarkin does an excellent job of getting downhill from a high release point, generating groundball outs with his fastball, which clocks in at 90-92 mph and features modest life. Some scouts saw the need for Clarkin to add a cutter as he climbed the ladder. Under the guidance of pitching coordinator Gil Patterson, he did just that in 2014. With the new weapon in tow, he’ll be able to coax even more groundballs. His best secondary pitch is a changeup, which scouts rank as plus. He also throws a big-breaking curveball in the 70-72 mph range. His delivery is clean, has some deception to it. Thanks to an elbow injury, Clarkin missed the entire 2015 season, but moved up to High-A in 2016 and did very well, once again: 3.31 ERA, 3.26 FIP over 18 starts. Remaining at the same level to begin 2017, Clarkin’s results improved (2.62 ERA) and he was eventually included in a big deal for Todd Frazier, David Robertson, and Tommy Kahnle. 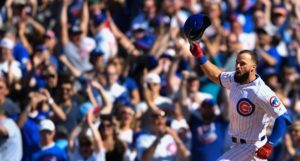 The White Sox added him to their 40-man roster after the 2017 season, which brings us to last year. Clarkin spent most of his 2018 season in Double-A, making 10 starts and 8 more appearances out of the bullpen, but, for the first time in his career, he appeared to hit a bit of a wall: 4.98 ERA, 5.24 FIP, primarily, it seems, because his strikeout rate mysteriously dropped from the upper-teens/low-twenties down to 11.5%. 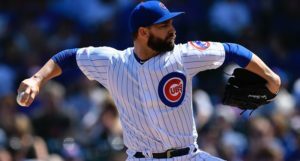 Immediate reaction: he does a lot of things very well (and we’ll get to them in a moment), but if his strikeout rate doesn’t bounce back dramatically next season, he may not be long for the Cubs either (of course, the sudden K-rate drop might be the reason he was available in the first place!). Because aside from some great early results, continued youth, and an impressive first-round pedigree, Clarkin has at least one more thing going for him: a fantastic ability to generate ground balls. Like Baseball America foretold back in 2014, Clarkin’s ground ball rate is among his greatest features. For his career, he’s averaged 47.8%, though it was even better during his Double-A stint with the White Sox last season (52.0%). If his batted ball data – which we can’t see in the Minors – is anywhere close to as good as I suspect it is based on his relatively low BABIP and consistently *really* high infield fly ball rate (19.7% in Double-A last season), he’ll be an excellent contact manager and, thus, solid overall pitcher in the big leagues, even if his strikeout rate is never above 20%. Again, it’s not quite clear what the Cubs think they have here, though it’s possible they don’t know, themselves. They probably just saw a former first-round(ish) talent become available with a few solid skills and some good results and decided they’d figure the rest out later. Indeed, they may try to slip him through waivers again at some point this offseason. I expect him to begin next season at either Double-A or Triple-A and as a starter, but don’t be surprised if his first cup of coffee in the big leagues is out of the bullpen (perhaps as soon as this season). From there, he’ll likely go as far as his strikeout rate can carry him, because the rest of his game is well-rounded. Optimistically, as a reliever, you might expect the strikeout rate to climb as he adds a few clicks to his fastball and narrows his repertoire, but that’s more of a hope than an expectation and he still could wind up as a starter, which would obviously be preferable.